My previous piece about Israel was posted here and included some of my personal experiences of present day Israel and my life as an exile and immigrant. 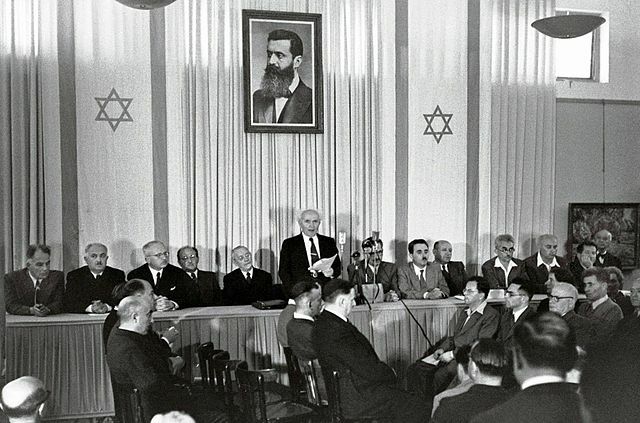 In this part, I take a look at the complexities emerging from the particular national identity that has been forged before, during, and after the establishment of the state of Israel. Hebrew has two words for nationalism. They are close to each other linguistically, and far from each other in connotation. One translates more accurately into chauvinism, in that it has distinctly negative connotations. The other, the “good” nationalism, is exalted. This time was the first since I left in 1983 that my visit coincided with the few days of the year where the national identity of a Jewish people fighting for its life against all odds becomes center stage in three separate holidays. Israel was created, after all, to be a Jewish state that serves as the sanctuary for all Jews in the world, a safe haven from the anti-Semitism that defined Jewish life, at least in Europe, for millennia. What this dream for a people persecuted for millennia would mean for the local people – a nightmare of unprecedented proportions – is something few thought about actively. As early as 1891 one lone voice (an essayist and social critic known by the pen name of Ahad Haam, literally “one of the people”) noticed and warned the newcomers that the way they were treating the local farmers, which he evaluated as contemptuous and arrogant, would have long lasting negative consequences. While he was in favor of establishing a more settled and culturally alive Jewish presence in the region, he was opposed to the idea of political Zionism which he saw as impractical. What he would have said had he lived to experience the Holocaust is anyone’s guess. I recently talked with my mother, who was eighteen during the War of Independence, also known by the Palestinians as Naqba (the catastrophe). I wanted to know what she knew and what she thought at the time. Was it known that hundreds of thousands of local people were displaced? After all, my own generation, born only a few years later, was raised on a thick and complicated mythology that the leadership of the Jewish population in 1947 had accepted the Partition Plan, and that the Palestinians had not. 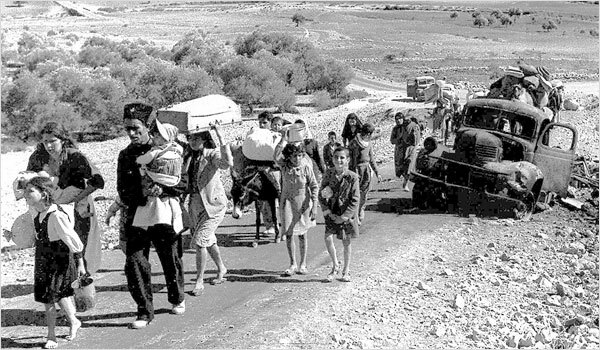 That “we” would have been fine for them to stay where they were, and they chose to flee in fear, encouraged by the rulers of the Arab states, who promised them they would return through the war that was declared on the freshly independent state of Israel in May 1948. My mother was very clear that she herself didn’t fully believe the story, that she sensed it couldn’t possibly be true. What about the public, I persisted, what was the conversation? She was evidently too young to notice, to reflect at that level. All she remembers is that the overwhelming majority of the population always believed the government’s official story. She herself always believed in two states, she tells me. And yet she was silent about it until I myself was seventeen, during the 1973 war, at which time she wrote an essay that no one was willing to publish called “In Favor of a Forced Peace”, in which she argued that Israel would never find its way to coexistence with the Arabs, and thus a peace imposed by the world’s powers would be the only solution. Why did she never speak with us, her daughters, about all of this? My father, older, more educated, authoritarian, her former high school teacher, was far more conservative, and she kept peace. As a result, I never had the benefit of being exposed to alternative thinking until well into my teens. My suspicion is that even when it was known that active force was used, it was seen as an unavoidable necessity that wasn’t so bad as compared to the suffering of the Jewish people. It was more a desperate willingness to see the displaced Palestinians’ suffering as inevitable rather than an active desire to inflict suffering. In the Israelis’ eyes, even those who knew, nothing else could ensure the possibility of a state that would serve as a sanctuary for Jews from all over the world. Even as I fully recognize the horror of what we have done, I am still haunted by the question: could it have been done differently? Would there have been a way for Jews to come back to our source without displacing others? I ask and ask myself, and I know I can’t bear to think that maybe it just couldn’t have been done any other way. I can’t bear it, because I do love so much of what has been created, and to know the cost tears me beyond my capacity to hold all at once. As hard as it is for me, a visionary who believes in a collaborative future in the region, I cannot imagine how anyone who still lives in Israel and is still weighted down by the fear of annihilation would manage to open to look at the effects of our actions. There’s nothing simple about it. All of this is made even less simple by the persistent reality of ongoing, intense, and regularly violent responses from Palestinians both before and after the establishment of the state and to this day. As waves of Jewish immigration arrived before the establishment of the state, even during and after the mass exterminations of Jews during the Holocaust, ongoing attacks on the fragile population continued. After the establishment of the state, these attacks morphed into a consistent stream of “infiltrators” as they were called, trained fighters from Arab countries surrounding Israel who snuck into Israel and targeted civilians. 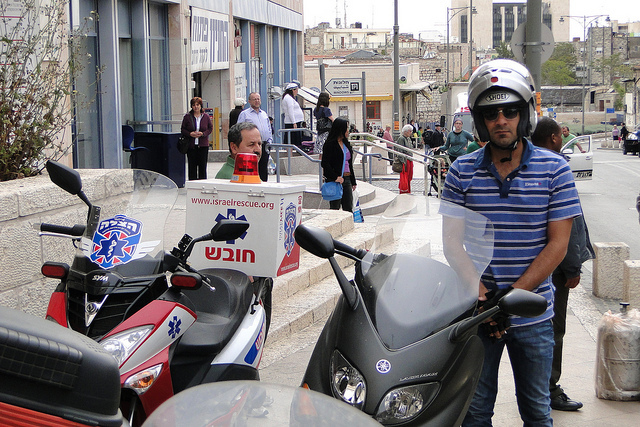 And more recently, the suicide bombers kept all inhabitants of Israel in permanent anxiety. Although all these acts can be understood no less than the Jewish acts, both being desperate responses of persecuted peoples, in the context of Jewish history they are excruciating. Where else can Jews go? And so it is that I come back to these holidays I alluded to earlier: Holocaust Remembrance Day, Memorial Day, and Independence Day, all related to this complexity of there being no other place for the Jews to be that has a felt sense of being “ours,” palpable even to Jews who are opposed to the policies of the state of Israel when they visit. These holidays are all very close together. The first two are characterized by a phenomenon I have not seen or heard of anywhere else. At certain moments, the national alarm system is set to operate for an entire minute. During this minute, everything grinds to a halt. Cars stop, schools stop, people stop on the street and in shops. After thirty two years of not being present, it was stunning to be part of it again. Even though I no longer relate to the founding stories that created Israel, I find myself being in awe when I realize that millions of people all over the small territory of Israel are standing silently at the same time. There’s a sense of togetherness that this activity engenders that I find remarkable and moving. Part of the national intensity that’s been created in Israel is that Memorial Day and Independence Day are back to back. One of the sirens announces the shift from one – a somber day of thinking about all the people who died in wars – to the other – a day full of gaiety and celebration. The transition is marked by a particular statement that is repeated often: their death gave us our living. This is one of the most charged statements I remember growing up, one that I actively reject these days, and yet its mythological force is still palpable. As Dave Belden and I went back and forth in bringing this very delicate and difficult piece to completion, he shared with me his own thoughts, going beyond his usual humble and extraordinary capacity for just supporting my own thoughts in being fully fleshed out. Here’s what he said: “What comes to my mind is simply human limitations. There are so many times when our own pain is such that we don’t have what it takes to empathize with other people’s pain, not even – or perhaps especially not – the pain of the people we are hurting. We are unable to do so individually at times, and collectively it’s even harder to avoid, I believe, because when we are all hurting we give each other permission to ride roughshod over others. Was there another way? Perhaps not, in the circumstances, but then, to accept that is to accept that there may not be in our current circumstances either. And indeed that may be a form of wisdom in itself: compassion for our own incapacity, or for all humans’ incapacities at times, to do what is needed. I like the idea of public mourning about our incapacity: without self-judgment, but with clarity about what we are not able to do.” Sometimes, there is nothing to be added to others’ words, so I asked his permission to use his here, with humility about not having thought of this beauty on my own. On the eve of this year’s Memorial Day, Arnina and I watched the most amazing ceremony, something that, once again, made me proud to be Israeli. A group called Combatants for Peace has been holding an alternative Israeli-Palestinian event. During this event, families from both sides speak their grief and tell their stories of loss, in all the wars, translated into Hebrew, Arabic, and English. The event was streaming live, co-hosted by a young Israeli woman and a Palestinian. It featured, also, videotaped statements from Palestinians who were unable to attend because of restrictions. Seeing Palestinians say explicitly that they want peace touched my soul to its very depth, especially the young girl from Gaza who was singing a peace song with deep joy and passion. Seeing families side by side sharing their experiences affirmed my faith in how simple things can be when we choose to stand together. Knowing that despite fierce and vicious criticism of this alternative ceremony there are more and more people who attend and watch with every passing year feeds my hope that there may yet be a collaborative future. Bottom: “Traffic Halts for 10 a.m. Observance – Holocaust Remembrance Day – Jerusalem – Israel” by Adam Jones, unaltered, Flickr, CC license. This post is brilliant. There’s no other word for it. For one thing, it leaves me grieved with my own impatience. When commentators discuss the various sticking points in negotiations over a two-state solution, they inevitably come round to the right of return, and I instantly think, “It’s just a detail. Let it go. Return to what? It was 70 years ago.” Of course I had no idea of the story as you’ve expressed it above. Yes, the right of return is every bit as important as every other factor here. I am deeply struck, too, by Dave’s extraordinary words about mourning for our incapacity. They leave me wondering about one possible way forward: maybe, when we mourn for our incapacity, we open ourselves to a certain kind of humility–i.e., a clarity of thought about our selves, our peoples, and the universe–where we can see the plight of others afresh and approach it with a new heart. Maybe.